Contrary to popular belief, hummingbirds don’t thrive on nectars/sugar water in order to drive their amazing, hovering flight capability. Hummingbird’s real food is composed of bugs and spiders, for that much needed protein, vitamin, mineral, and fat intake. However, nectars are a critical part of their diet in that glucose in them serves as an energy fuel, so they can continue their relentless bug hunting. With that being said, it doesn’t mean that you have to constrain yourself to nectar feeders only; you can also attract bugs for them as well. For example, you can place ripe banana chunks on the side to attract flies. But first, you need to attract hummingbirds to your feeder in the first place, and in order to do that you need to know what kind of plants attract hummingbirds. Perennial plants: daylilies, lupines, bee balms, columbines, hollyhocks, coral bells, phlox, red-hot poker. Annual or biennial plants: foxgloves, lantana, salvia. The best thing about attracting hummingbirds to your backyard/garden area is that these colorful plants will make it look like a relaxing, exuberant paradise coming straight out of a movie set. It is no wonder then that hummingbirds have become so popular, as welcome guests to your garden. They hunt all the bugs in the area that you don’t want, they are tiny and cute, and making them welcome also makes your garden attractive for your human guests as well. If you look up hummingbird feeders online, you will immediately notice that the prevailing color is red. However, as the aforementioned flowers indicate, the feeder could be colored purple, orange, bright blue, and any color in between. The idea is to not necessarily have a red hummingbird feeder, but one that stands out in the area, so that hummingbirds can hone in on it. That’s how their brains evolved. When choosing the right material the feeder is made of, don’t follow the seemingly intuitive route and get one from wood. That would be a bad idea as wood cracks under the sun, is heavy, and is harder to clean up. Additionally, the wood absorbs liquids so you could frequently develop a nasty case of molding. All of which are perfectly safe, robust, and non-toxic for hummingbirds. You should especially keep an eye on feeders made from recycled plastic because by doing so you incentivize reduction of plastic waste in the environment. The more people buy products from recycled plastic, the more plastic will be recycled, instead of ending up in oceans and forests. Hummingbird feeders should be composed of minimal amount of parts, so that way you can reduce the chance of something breaking. They should also be easy to clean and maintain. Unlike with general bird feeders, you don’t have to worry so much about the squirrels hijacking the feeder, as they go for nuts, not so much for sugared water. Brightly colored, so they stand out in the immediate environment. A sturdy mount, so you can easily affix it to trees, walls, or hang it from a tree. A transparent tubular main body for holding the nectar, so you can see when the nectar needs to be replaced. A wide bottom area attached to the main body, so hummingbirds can easily land and feed through the ports that mimic natural tubular flowers. Once you have chosen your hummingbird feeder, you only need to consider the right placement. If possible, make sure it is placed in a shade or in a half-shaded spot, preferably near some flowers listed above. 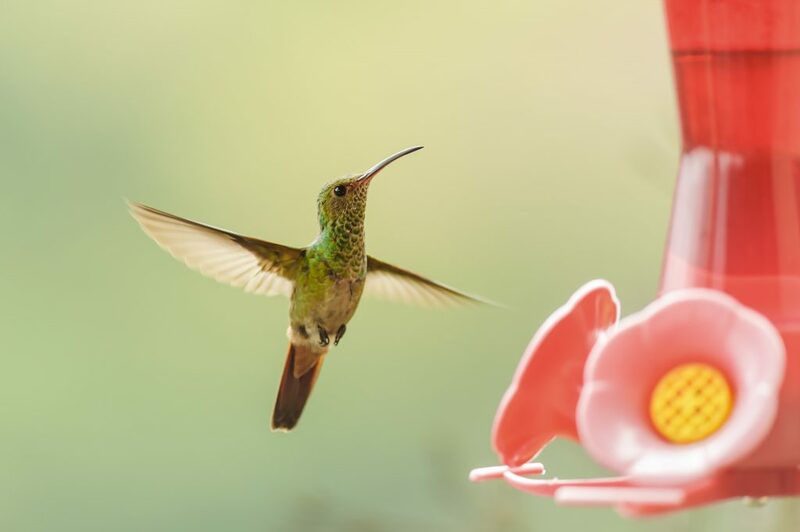 For the new hummingbird enthusiasts, settle with a smaller feeder first – one that has about 8oz/230mL reservoir – that way you will not be left with a regularly soured sugar water because you have overestimated the hummingbird’s interest in your garden/backyard. With the spreading popularity of hummingbirds, you can easily find nectars for them in any pet store, but that is not at all necessary. Nectar is simply a sugared water, i.e. the glucose they need for their intensive helicopter-like flight. For every 1 part of white sugar add 4 parts of hot water. If you have a brightly colored feeder, you don’t need to add food coloring to the sugared solution, as it doesn’t exist in nature. In fact, don’t add any additives to it at all. If you like to keep batches of it for easy future refilling, keep in mind that you should only refrigerate the nectar for up to two weeks. Obviously, the sugared solution feeding the hummingbirds will directly impact their nutritional needs and health. Therefore, consider the following – do flowers in nature clean themselves up with detergents? The answer to that is a resoundingly NO – avoid all types of chemicals when you clean up and replace the nectar, which should be done about 2 times per week. Or even more frequent if the weather is particularly hot. Add 2tbsp of white vinegar per 1 cup of hot water. Fill the feeder with that mixture and let it sit for about 5 minutes. Vigorously shake it, and rinse everything with hot water until there is no trace/scent of the vinegar. If you happen to notice black spots in the feeder, you have a case of mold, which indicates that you have neglected to properly and frequently clean the feeder. If that happens, in addition to vinegar, add some sand to rub to black spots out. As hummingbirds are attracted to blooming flowers, which only bloom in warm/hot weather, that means that hummingbirds will migrate when the warm climate season is over. No amount of cozy and plentiful feeders will stop them from doing so, as they instinctively react to shortening of the daylight. The top-shape males will begin to migrate first, while the weaker, younger, and female hummingbirds will straggle along in the weeks to come. To make sure that you don’t sabotage the ‘stragglers’ leave the feeder(s) for at least further two weeks, after you have noticed that your resident hummingbirds are gone to warmer climates.